This Swarovski Pearl Ribbon Bracelet comes with a coordinating Swarovski Crystal Pearl Dangle and a sterling silver Ribbon Charm, as shown. They also added a Courage Bead and a Heart Toggle clasp to their order. The Swarovski Crystal Pearls are 8mm Round and Made in Austria. The clasps are all sterling silver. You may add charms and other beads to this design. 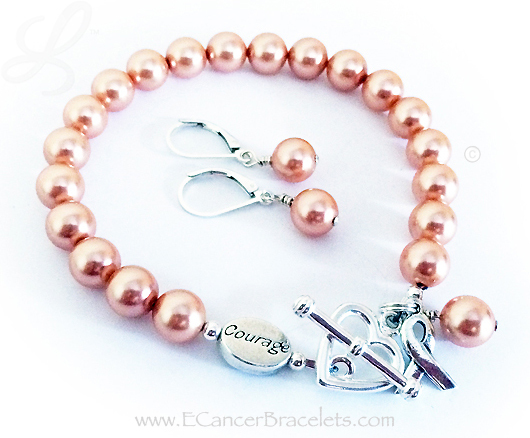 I have Swarovski Pearls in several of the Cancer and Awareness Ribbon colors. The colors we have are listed below. If you want a color that isn't listed, please contact us and we will see if it is available. 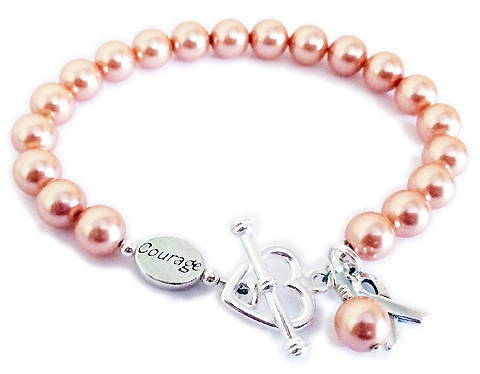 This Peach Ribbon Bracelet comes with the coordinating Pearl charm and a Ribbon charm. They added a COURAGE bead and upgraded from my free toggle clasp to a Heart toggle clasp.